Have you seen news reports about foreign websites showing live feeds from unsecured wireless cameras — like nanny cams, baby monitors, and security cameras — in the U.S. and around the world? It’s creepy stuff, but there are steps you can take to protect your camera from prying eyes. If you’re shopping for an internet protocol (IP) camera, look for security features that will help protect your privacy. You want a camera that encrypts the data it sends. 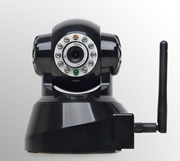 Make sure both the camera and your home wireless network use security protocols. WPA2 is the strongest. Once you’ve bought your IP camera, check its security settings and keep its software up-to-date. If you bought a camera that encrypts data — and I hope you did — turn this feature on. Hackers are familiar with common passwords, so be sure to change the IP camera’s default password to a password that’s hard to guess. And check to make sure the login page for your camera has a URL that begins with https. Finally, review the FTC’s article for more tips about using webcams safely. Thank you for your comments.. I'm very uniformed when it comes to the Internet. Yes we as consumers NEED the government to protect us from our own ignorance of technology. What do you think we are rocket surgeons? How can I encrypt the webcam that is built into my laptop? Not funny Richard. This is serious business. Move along, nothing to see here, and find a comedy zone website that will welcome your silliness. I have had a post-it note stuck over my webcam lens for over 3 years. I never trusted the things in the first place !! Do we need to Encrypt the webcams that are built into our computers? Can the Gov or police tap into our webcams that are built into our computers? Even if they aren't turned on by us. Yes, they can do that, Kryc. But there's an easy, surefire solution: Place an adhesive bandage or other opaque item over your webcam's lens. That way, no matter who grabs control of your webcam via the Internet, they'll see NOTHING. The security problems discussed in this blog post are specific to IP cameras -- that is, cameras that connect directly to the internet wihtout a laptop or computer. Your laptop's built-in webcam connects to the internet using a program on your computer (like Skype or FaceTime). Before using one of these applications, you'll want to research the program's security settings. In addition, be sure to secure your home wireless network. This is meant for cameras connected wirelessly to a monitor or computer, not a wired camera. An ip camera is most often used for security. Webcams and encryption features. Sounds Good! What about the cameras on our cellular telephones? Teresa and Scott, I too am living in the horror that is cyber stalking. Malicious rumors have ruined my name, just like you Teresa I am seriously upset. But I do not know where its coming from. Have no proof except my life has become someone's favorite "show". This is not freedom and its an invasion pure and simple I am not respected at work or in my town as though this is all some joke! WE have laws but mob rules and school yard rules are the norm. They are skilled and talented at using their devices and acting innocent. And yes officialdom just looks the other way or they tell me its just me that I am weird with no sense of humor and paranoid. You are not alone but I am just angry because I do not know how to stop this. The worst part yes, to be treated as some sort of criminal. I agree that it has risen to a whole new level of gang activity they seem amused at perhaps someone losing their peace and taking their lives. Hi ... Mellie. I am having the same issues with the same things you are . Hotmail , Comcast , Apple . I am terrified and I have a baby and my monitor has been hacked also . I don't even know where to start . It has interrupted my life in such a scary way . I also just do not understand what these people want . This is the first I have said about it . I'm around the same age as well . It was just a few days ago that I realized how bad it has all become . It's scary no matter who you are for sure . I just fear for my safety and my babies safety . If you have found anything out...PLEASE share ! experienced odd things & still don't know what to do. Anyone thattries to help gets harassed & they seem to get frightened. I've been told to keep my head down & move on but how so when communication is redirected, emails probably rewritten & sent. Anyone gone to DevCon? (The developer conf each year in Vegas?) let's go!! Develop backup communication plans with people & have a few designated people to check on u. It's isolating, & THATS the goal! A documentary would be so mind blowing to others. Keep a journal & don't try to figure it out. Data will keep u sane & ultimately help. Vegas anyone? Some people r evil. Their deeds will catch up to them soon but in the meantime, I request of any reading these,please "don't be evil." Be careful when downloading an APP on to your mobile phone that requires access to your camera... even though the APP has nothing to do with taking pictures or recording video. Most of my computer time is work-related but - just to be on the safe-side - I keep a piece of blue painter's tape over my personal computer's camera. I only use "webcams" when I'm doing a work-related meeting/presentation and I only use the business-issued laptop for that. If I want to post anything "public", I put it on Facebook - never real-time photos or video. I can't think of anything so important to visually share at the moment it is happening that is worth the potential issues associated with a security breach. Unfortunately, scammers can copy a company logo and use that to make it seem like a sale is safe. When you're shopping online, don't buy something expensive if you haven't seen the item and met the person, and confirmed that both are legitimate. Also, the surest sign of a scam is when someone asks you to wire money before you've seen the item. Wiring money is like sending cash; once it's gone you can't get it back. You can file a complaint about this with the FTC at ftc.gov/complaint. You can also file a complaint with your state Attorney General’s office. Read more info or ask carefully in forum before purchasing products can prevent those awful things. Hackers will always find new exploits to find ways around encryption. Dont be attached to the emails you should change them on first sight of spam..
Once your all set up again keep changing all your passwords every 3 months..
get with the times folks... Im hearing too many scary stories on this thread that could have all been prevented..